Your family is important to you. You’ve promised yourself to keep them feeling comfortable and healthy, especially in the home. We want to help you feel confident you’re doing that with our Pure Fit Promise. Aprilaire whole-home air purifiers help remove harmful particles form your home. Particles like pollen, pet dander, bacteria and even viruses. Trapping these particles helps reduce asthma, allergies and other health and comfort conditions related to polluted indoor air. 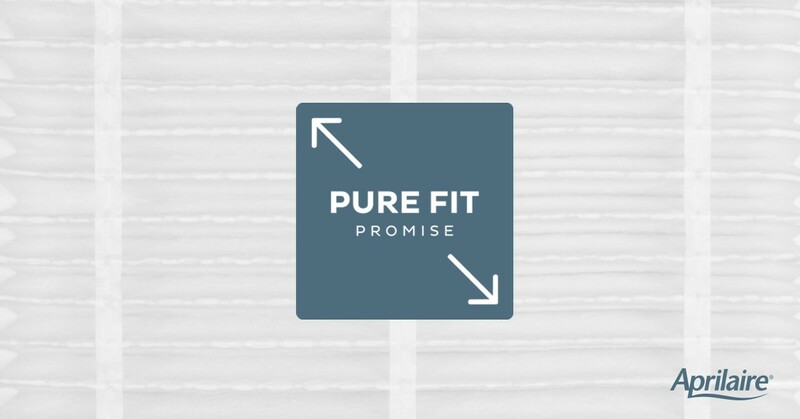 The Pure Fit Promise is our guarantee. When you use genuine Apriliare air filters in our air purifiers, it was made specifically for your system. As long as proper filter maintenance is kept up, your air purifier will deliver the same protection promised to you the day it was installed. Our Patented Self-Seal technology reduces bypass, improving filter performance and providing superior protection of your home and indoor air quality health. The Interlock Rail System allows your high-performance air filter to work without cardboard or metal reinforcements – the fit is perfect every time! Our air purifier filters are so effective at removing contaminants that are harmful to your family and your HVAC equipment, we offer you a 10-year guarantee. Trust Aprilaire to deliver on its promise of a healthy home so you can deliver on yours! Order genuine replacement parts for your purifier today or locate a professional in your area to have a solution installed.